A tank measuring 18″ x 12″ x 12″ (45cm x 30cm x 30cm) – 42.5 litres is adequate for a small group of these. C. melanotaenia will thrive in a tank set up to replicate an Amazon biotope. This would be very simple to arrange. Use a substrate of river sand and add a few driftwood branches (if you can’t find driftwood of the desired shape, common beech is safe to use if thoroughly dried and stripped of bark) and twisted roots. A few handfuls of dried leaves (again beech can be used, or oak leaves are also suitable) would complete the natural feel. Aquatic plants are not a feature of this species‘ natural waters. Allow the wood and leaves to stain the water the colour of weak tea, removing old leaves and replacing them every few weeks so they don’t rot and foul the water. A small net bag filled with aquarium-safe peat can be added to the filter to aid in the simulation of black water conditions. Use fairly dim lighting. Temperature: Prefers things a little cooler than many South American species. Somewhere in the range 68 to 73°F (20 to 23°C) is best. Like most corys, it’s easily sexed when viewed from above. Females are noticeably rounder and broader bodied than males, especially when full of eggs. This species isn’t seen all that often these days, which is a shame as it’s very attractive when in good condition. 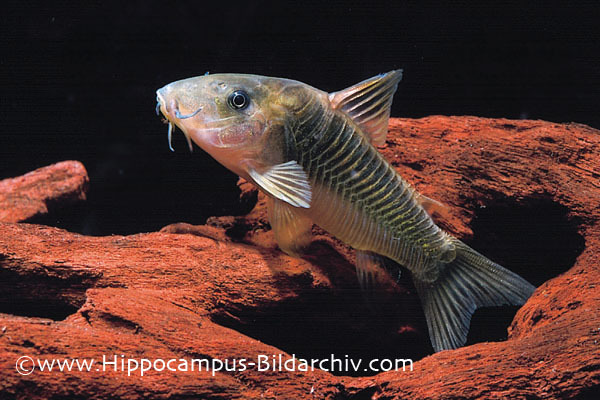 It’s also known as the “elongate bronze cory” and with good reason, as at first glance it does indeed resemble C. aeneus quite closely. However on further inspection the differences between the two become apparent. C. melanotaenia is unsurprisingly the more elongate fish overall, and has a distinctive golden/yellow tinge to the fins.